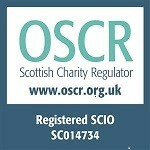 Looking Forward Not Back is a Scottish Government project administered by YouthLink Scotland. The aim of the project is to train young people as researchers on issues affecting their local community; the research programme is also accredited to SVQ level 5 which gives participant a recognisable qualification to add to their curriculum Vitae. This can be an advantage for the young people looking for employment or further education opportunities. In August 2015 Stewartry CVS was funded by YouthLink Scotland to train a group of local young people to undertake research into sectarianism in their local community. A group of eight senior pupils were identified in the Douglas Ewart High School Newton Stewart as candidates to participate in the "Looking Forward Not Back" project. 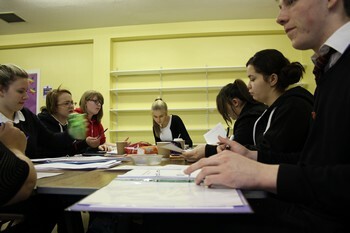 The young people have since learned about both sectarianism and recognised research methods. They have also engaged with a number of community groups including peers, young parents and elderly day centre users to build up a picture of sectarianism and how it affects their local community. Following an examination by two external assessors the eight young people were given perfect marks in the work they had submitted based on their findings. 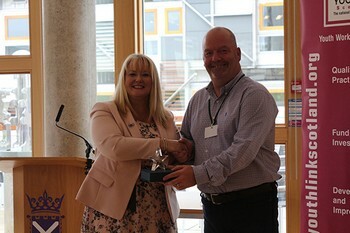 They have since been awarded SVQ level 5 certificates at a ceremony attended by invited guests and Scottish government representatives at the Scottish Parliament. The project is a good example of Stewartry CVS working with multiple partners to deliver an outcome. The stakeholders in this case included, The Scottish Government, YouthLink Scotland, Douglas Ewart High School, Community Learning and Development, youth researchers, Penninghame Primary School and Riverside Day Centre. 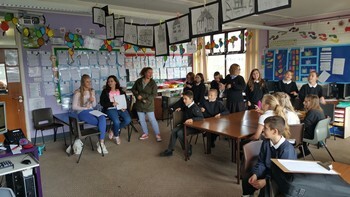 Young students from the project working with Primary 7 students from Peninghamme Primary School. Then discussing the project and how they will formulate their submissions to Looking Forward Not Back. 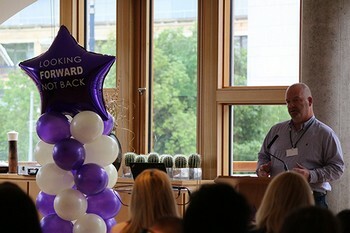 Stevie Carr speaking at the end of project symposium at the Scottish Parliament. Receiving the award on behalf of the students from Douglas Ewart High School, Newton Stewart from Christinna McKelvie MSP.